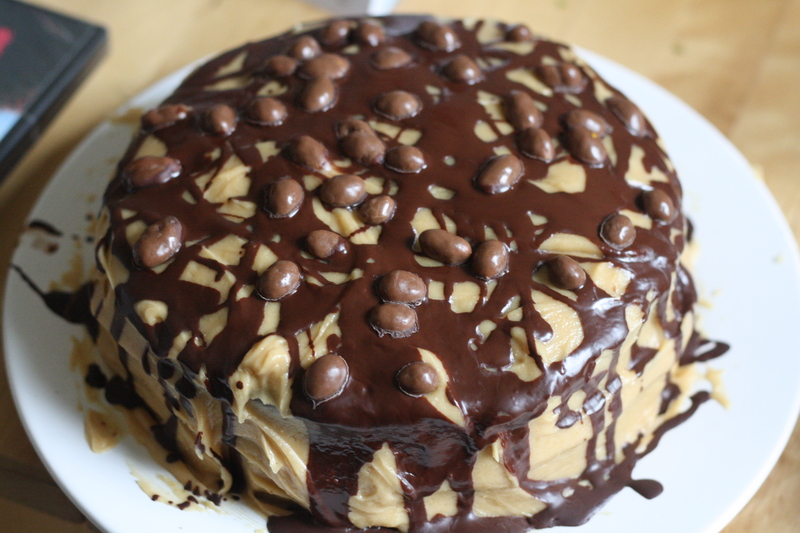 Peanut butter and chocolate cake. Oh yes. I recently had a birthday, which was pleasant. I saw my family and some friends, added to my ‘to read’ pile and my gin collection, and I made a cake that induces a sense of euphoria and remorse that I like to call euphorse. The only trouble is that as I get older, birthdays are beginning to feel a little bit like markers for everything I haven’t done yet – not least because mine falls at the end of the month, where the deadlines live. On birthdays you are expected to celebrate, see all the people, and generally draw attention to yourself. This didn’t used to bother me because, like most writers, at heart I am a bit of an egotist. I couldn’t very well expect people to read my stuff if I thought it was crap, or a waste of their time – naturally I think everything I have to say is erudite, insightful, or at the very least fantastically interesting. Except for when it isn’t working and I’ve no idea how to fix it, or I’ve just read something really amazing by someone else and realised I’ll never be as good as them, or I haven’t had enough sleep and keep making mistakes, or I’ve had too much sleep and have written an entire chapter in my mind’s eye but forgotten it all by the time I reach a notebook. b. Tell the truth – nothing is finished to my satisfaction so I haven’t even sent out any queries, the last paid journalism work I had was months ago, and man I am a fraud, I should get a real job. Essentially over the past year or two – since finishing 12 books, in fact – birthdays have become a time to take stock, compare myself to everyone else in the world who has ever been my age, and to think ‘oh crap, what am I doing with my life.’ Looking at my folder of unfinished manuscripts and my list of unfulfilled competition deadlines, it sometimes feels like ‘not much, really’. I look at other people my age or younger, see what they have achieved professionally or personally, and come away with a strong sense that I am all mouth and no trousers. Still, nevermind eh. The run up to a birthday may be a legitimate time for reflection – but now it’s over for another year, the time for self indulgent wallowing is past. So I’ve missed some competition opportunities lately, so what? I was working on re-writing book 7 at the time, that’s a pretty good reason. So I haven’t had any paid journalism work for a couple of months – that’s probably because I haven’t pitched any. Time to pull out the finger and come up with some good article ideas then innit. So I haven’t polished to perfection any of the fourteen manuscripts kicking about my hard drive – I’ve got FOURTEEN MANUSCRIPTS ON MY FREAKIN’ HARD DRIVE. Finishing those was always going to take some time – stop bitching and get on with it already. In conclusion, the only person holding me up is me. Now if you’ll excuse me, I have some deadlines to meet. You write this excellent, poignant post as my own birthday approaches and I find myself going through similar motions and existential doubt moments. Thank you and taking stock is a good thing… as long as we follow up and get on with the things we’ve taken stock of. I concur. Good luck with the event when it comes, and resist the temptation to re-train as an accountant or chartered surveyor!